Many individuals recoil at the idea of signing a prenuptial agreement because they feel that by doing so, they are expressing doubt that their marriage will last the remainder of their lifetime. This simply is not true. A prenuptial agreement says nothing about the strength of a couple’s marriage, nor is there a correlation between signing a prenuptial agreement and getting divorced. A prenuptial agreement can provide peace of mind for a couple. By writing their financial decisions regarding their marriage, a potential divorce, and either partner’s death into a prenuptial agreement, a couple can feel secure knowing that the divorce or probate process will be fairly straightforward for them and their loved ones. A prenuptial agreement can only be used to create guidelines for the couple’s finances. It cannot be used to determine their lifestyle or anything related to their children’s care and support. Below are the issues can you can cover in your prenuptial agreement. In a Florida divorce, the couple’s marital property is divided equitably between them while their separate property remains with its owners. Generally, any assets obtained during the marriage that are not gifts or inheritance are marital property. In a prenuptial agreement, a couple can decide which of their assets are separate property and which are marital property. For example, if a couple owns two homes, they may choose to each take sole ownership of one house in the event of their divorce. Similarly, a prenuptial agreement can be used to determine how the couple’s debts will be divided in the event of their divorce. 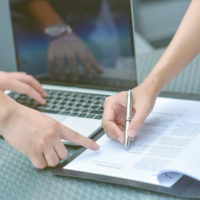 Prenuptial agreements are common among individuals entering their second and later marriages because often, these individuals have children from their first marriages. In a prenuptial agreement, an individual can state which assets are to go to his or her children in the event of a divorce. A prenuptial agreement can be used to underscore an individual’s estate plans and ensure that his or her children inherit his or her estate. A prenuptial agreement can also provide financial guidelines for the couple during their marriage, such as stating how much of their money goes to savings and what is to be invested. It can also be used to create guidelines for how each account is used, the bills each spouse is responsible for paying, and how the couple will handle the financial aspects of purchasing property, starting a business, and paying for any continuing education either partner decides to pursue. A prenuptial agreement is not a plan for divorce, it is a guideline to follow if you do divorce. When you and your partner create a prenuptial agreement, work with an experienced divorce lawyer to ensure that your document is legally enforceable. To start working on your prenuptial agreement, contact the Law Offices of Steve W. Marsee, P.A. today to set up your initial consultation in our office.